I want to begin this week’s forecast with inspiration from the frontlines—even if they are the frontlines of the past. (Sadly these battles are not over.) I need to hear from someone who has challenged the status quo, whose words and life still inspire me to challenge myself. Audre Lorde did that in her work as an activist and poet. She dared to be powerful and strong as she served her vision, and she did it afraid. The fire of Sagittarius—the seed of potential for this lunar cycle*—mixes potently with Uranus, the planet of awakening in the cardinal fire sign of Aries this week. Sagittarius pursues the vision. Aries does it afraid. Each of us has a frontline, whether it is on the streets facing a line of armed police, or whether it is an oppressive work situation, or whether it is the voice of shame in our own thoughts. I believe each of us is being called to stand up in our power and strength, even when we are afraid, to serve a vision of change. As the Moon waxes into fullness this week, the brakes come off, momentum builds. A couple of grounding days mid-week while the Moon is in Taurus is a chance to anchor to our core values and to our bodies’ wisdom, which are essential ingredients to any sustainable revolution. When the Moon moves into Gemini a day before the Full Moon on December 6, the desire to connect, share information, and broadcast the vision is palpable. Last week I shared a lunar intention inspired by the Sagittarian quest for the “truth that creates expansion, possibility, and delight. This lunar cycle in Sagittarius is an opportunity to cultivate the type of truth that frees us.” As the Moon waxes to fullness, energy builds. Skillful navigation of this energy helps us to open up to liberating truth. It is about time we were able to stand joyfully at the frontline of change. It is time to make a shift. Sunday, November 30. Most of the day (CST), the Moon is in Pisces dissolving our barriers and boundaries. We could easily feel a bit more vulnerable but also more aware of others’ pain. The heart has essential information for us. The square between Mercury in Sagittarius and Neptune in Pisces encourages the heartfelt exchange of information but there is a caution. We could also encounter manipulation of perception. Or in other words, we could be fooled by lies or fantasies. Be discerning. The impulse to move beyond mere logic to a place of compassionate connection is a place of growth and a basis for action as the Moon enters Aries later tonight for two more days. Monday, December 1. Caring for ourselves as much as we care for the world helps us to stand at the frontline of change. The sextile between Mars in Capricorn and Saturn in Scorpio lends depth and structure to the ways we want to push the edges today. The Moon contacts Uranus in Aries and Pluto in Capricorn by stressful aspect, providing the spark to ignite action at the frontlines. The ongoing square between Pluto and Uranus, which has influenced so much revolution around the world since 2012, becomes exact again the month. There are only two more exact squares between these two planets. Subtly and not so subtly the world is becoming ever more ready to move into new paradigms. Notice the headlines and the social media feeds. Where are the places that nurture the change you wish to see? Add your inspiration and your action. December 2—Gibbous Moon: Perfecting. This phase of the Moon (building to the release of the Full Moon) can emphasize a critical approach to manifestation. We can get caught up in sifting and sorting—trying to get everything perfect before we reach the peak of the cycle. With this week’s transits we are far less careful. A grand fire trine of planets may impel you forward to an early climax! Or will you suddenly freeze up? Grand trines offer easy access to elemental energy, but they can also be easily squandered. Pay attention to your energy. Think of your passion as a fire to be tended gently and consciously. Do you need more fuel? More space between the logs? Do you need to reinforce your fire’s container, or have some water nearby in case the flames burst out of control? We have the opportunity to mindfully tend to our passions with the long view in mind. How does this lead your to your liberating truth for this lunar cycle? The fire signs are concerned with identity, self-expression, and personal truth. These issues could spark conflict tonight as the Moon forms a square with Mars. However, the friction could help us make necessary adjustments in this perfecting phase of the lunar cycle. Wednesday, December 3. Bless the ground beneath your feet. The next two days, while the Moon is in Taurus, is a good opportunity to connect to your anchors and grounding cords. What this means to me is to take time to energetically appreciate and sense into your animal body, which is being supported by the earth beneath you. It also means tapping into the values that sustain your wellbeing and the wellbeing of others. Grounded in our bodies, we are better able to respond to the many changes coming our way. Grounded in our values, we are better able to discern right action when passions move us to the frontlines. Thursday, December 4. If we thought of energy as wealth, it will be interesting to see how we spend it today, and why. Venus in Sagittarius is trine to Jupiter in Leo. These planets are the benefics, so this harmonious aspect between them can only bring great stuff, right? Maybe. There is great potency in this connection but good outcome is not guaranteed. If you thought of your creative spirit and your personal vision as wealth, how would you spend it? With the Moon in Taurus, we really want to get value from our expenditures. Pay attention to how you use your wealth today. The impetus to expand our horizons and push the boundaries gets a super boost when the Sun in Sagittarius trines Uranus in Aries. In addition, Mars enters Aquarius today activating us to shake up complacency. Friday, December 5. Although the Full Moon technically happens tomorrow, we feel it as soon as the Moon enters Gemini today. This could be an extra-stimulating Full Moon. Gemini (Moon) and Sagittarius (Sun) are both excitable, especially when it comes to knowledge. Our thoughts matter. Minds are active with the Moon forming a trine to Mars in Aquarius. Information becomes a source of comfort. Truth is personal and conflict between points of view could feel extra challenging. With this temperament as the context for the day, the square between the Sun and Chiron becomes even more significant. Chiron reminds us of wounds that cannot be easily healed, of paradox, and wisdom. Chiron in Pisces offers the heart of sacrifice to imponderable truths. The way out of conflict may not be the rational approach, but the willingness to feel deeply what others’ are feeling. Mercury in Sagittarius trines Uranus in Aries this evening (CST) coloring the Full Moon chart tomorrow. Expect breakthroughs in consciousness. Perhaps the liberating truth reveals itself. 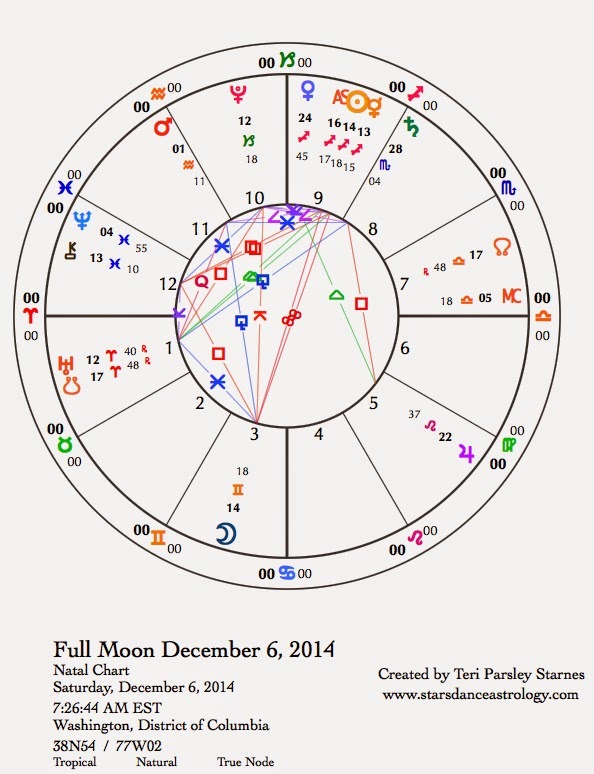 December 6—Full Moon: Illuminating. Full Moons give us perspective on our New Moon intentions. My lunar intention was to pursue the truth that brings freedom. For me, a liberating truth is vastly different from the kind of “truth” that imprisons. A liberating truth does not need to be forced on anyone, engenders creativity in others, and invites endless permutations. The Moon in Gemini illuminates this diversity in truth as freedom. Although a liberating truth can be hard to grasp, it can also be as easy as a good belly laugh. Another illumination of this cycle is the importance of joy in the fight for change. Notice the illumination coming from others—inspiration, courage, inventiveness, constancy—we need these to light our way. The chart for the Full Moon emphasizes an aspect pattern involving the Moon, Sun, and Chiron. In yesterday’s forecast, I wrote about the Chiron square Sun portion of this pattern. The Moon adds our habit energy to the mix. What habits do you have in response to pain, yours and others? What habit energy do you have in response to paradox? How comfortable are you with complexity? There are no final solutions, but perhaps we learn a little bit more about expansive truth that can be coupled with compassion. A minor aspect in this chart intrigues me: a quintile between Mars in Aquarius and Uranus in Aries. Quintiles are creative and compulsive connections. Both Mars and Uranus are about action and change, awakening and experimenting. The next few days while the Full Moon phase of this cycle plays out could be extremely creative and surprising. Venus in Sagittarius is separating from a trine with Jupiter in Leo. These two have infused the week with feelings of abundance, especially abundance of fire—passion and action. Venus makes an appearance as the Evening star soon. Perhaps you’ve already seen her bright light in the west after sunset. Venus disappeared from sight in mid-August and makes a triumphant return to the visible stars. Celebrate the truths you have found in the darkness this past fall season and let them shine for all to see. The sky is a repository for collective truths, not just for humans, but also for many (perhaps all) creatures. Animals migrate by the sky. Plants orient themselves to the sky. Humans place their important stories in the sky and call them constellations. Truth is information, a meaningful story, which serves a purpose. As nights become longer (in the Northern Hemisphere) and the sky spreads out its stories in a blaze of starlight, we are called to look up and ponder truths. Sagittarius is the season of truth and night sky. The wonder of it all leads to the telling of truths. Truth is a two-edged sword if there ever was one. It’s easy to see examples of the type of truth that destroys—the type of truth that is too tightly held because we fear uncertainty, the type of truth that conveniently filters out the conflicting truths of others, the type of truth that refuses to evolve and so becomes a crutch or a weapon. It is easy to see examples of these truths, which can deaden our spirits, becoming bludgeons instead of inspirations. But it doesn’t have to be this way. There is another type of truth that is as easily available to us and is indeed our birthright—the type of truth that creates expansion, possibility, and delight. This lunar cycle in Sagittarius* is an opportunity to cultivate the type of truth that frees us. 1) Remember how it feels, this liberating truth. I happen to find the night sky a perfect place to find this feeling. Whatever wonder inspires you, breathe it in. Notice the difference between the truth that imprisons and the truth that frees. Breathe that in and affirm that we have the ability to recognize this truth. Let’s not accept substitutes. 2) Develop discernment. Notice the difference between illuminating truth and fundamentalist truth. (Here’s a hint: this doesn’t mean the difference between my illumination and another’s wrongheadedness.) This is tricky. It is easy to be enamored by our own insight. “Yes, this is it! Now, everyone just do what I say!” It is equally as easy to criticize someone else’s truth for being idiotic or destructive. For me the real skill comes from noticing my own stories. Which of them create my freedom and which prolong my suffering? As the lunar cycle waxes, let’s develop practices or memory devices (a felt sense) that help us to know the difference. 3) Keep practicing and exploring. Perhaps at the Full Moon, a new insight and integration will occur that helps us even more to notice our stories and truths for the ways they affect us. 4) Celebrate the shifts. If the Sagittarian quest is to find the liberating truth, then don’t hold back when you experience it! Sagittarius is an expansive sign. The influx of life force energy is crucial for our health. Joy is a tonic. 5) Support others when you see them reframing their stories, when they tell a truth that inspires, when they add to the realm of possibility. We can help each other to escape our prisons. Let down the walls. Sunday, November 23. Yesterday’s New Moon is still in operation. What are you dreaming up for this lunar cycle of expansion? How will you broaden your horizons? How will you develop a better sense of what liberating truth feels like? We may feel strongly that we need to take on a learning project. Do you need to go back to school, get that certification, or network with experts in your field? Let the mutable fire of Sagittarius burn off some of the heaviness of the Scorpio lunar cycle. As the week goes on, we will feel more of this expansion. Today, the mood is mixed. Chiron in Pisces stations direct, increasing the tendency to take things personally. Vulnerability can feel overwhelming. We are sensitized to the suffering of others. Yet in the midst of this empathy we feel the grand fire trine between the Moon, Uranus, and Jupiter energizing us to take action. Monday, November 24. Is it yes or no? We feel the push and pull between Sagittarius and Capricorn today. Sagittarius says yes first and then thinks about it. Capricorn likes to immediately say no, and then reconsider. What lies between your yes and no? Mars in Capricorn is quincunx Jupiter (ruler of Sagittarius) in Leo. The quincunx aspect feels like we are yo-yoing back and forth between paradoxical stances. Paradox illuminates unexpected truths. Yes and no blend. Perspective expands when we accept limitations. Conflicts could occur around the tensions between external authority (Capricorn) and self-determination (Leo). November 25—Crescent Moon: Beginning. The words of “To Dream the Impossible Dream” are running through my head right now. The song is about Don Quixote, a dreamer who was willing to do whatever was required for his dream. The big Sagittarian dream, “the unreachable star,” feels just a little overwhelming right now, but the mood will lighten. Knowing that, can you acknowledge how important your dreams are? It makes sense that we care deeply and are willing “to fight the unbeatable foe.” The Moon makes a tense contact with the Pluto/Uranus square. We are more aware under the idealism of a Sagittarian lunar cycle that we must be the change we want to see in the world. Under the Crescent phase of the Moon, notice the strength of your dreams. They give us the impetus to begin again and again. Mercury in Scorpio conjoins Saturn perhaps contributing to the feeling of being burdened by our dreams. But the reality check is good. It contributes to the goal of ruthlessly appraising the stories we tell ourselves. Let’s discern between a dream that imprisons and a dream that frees. Wednesday, November 26. I said it would feel less burdensome as the week goes on and today is when we notice the shift. Tomorrow’s holiday may be contributing to the uplift, but we are also less conflicted about acting in alignment with our dreams. The trine between Venus in Sagittarius and Uranus in Aries invites in the allies who will support not only our dreams but also our awakenings. Connect with others who inspire you and bring inspiration to your gatherings of friends and family. What if we are the ones we’ve been waiting for? Fires need to be fed. The Sagittarian fire will feed our dreams if we feed its flame with joy. When the Moon moves into Aquarius, the focus becomes even more about revolutionizing our lives. As long as we can change, there is hope. The day ends (CST) with a square between Venus and Chiron. Compassion and joy can occupy the same heart. Perhaps this is the best way to begin our Thanksgivings. Thursday, November 27. U.S. Thanksgiving. With the Moon in Aquarius, political discussions are on tap for this Thanksgiving holiday. This can create a delicious sense of righteousness if everyone at the table agrees with us, or a fraught sense of judgment if they don’t. What a perfect opportunity to expand beyond our limited truths to see more nuance and variation. In the introduction to the week, I suggested this Sagittarian lunar cycle would be a good opportunity to cultivate the truth that frees us. We’ve been spinning through the same cycles of conflict for a long time. What is a new way to create a world of liberating truth? Mercury leaves Scorpio for Sagittarius tonight (CST) leaving Saturn all alone in Scorpio to mull over the darkness. Thoughts become a little less obsessive and we feel infinitely more curious and social. Friday, November 28. In the early part of the day (CST) the Moon forms a t-square pattern with Jupiter in Leo and Saturn in Scorpio. I’ll be honest; I am not a big fan of Black Friday. I never shop on the day after Thanksgiving. With this t-square, the mood in the malls could be both volatile and leaden. It is probably better to ally with the oppressed workers and leave your own shopping for later. With the entrance of the Moon into Pisces, we want to shut off social input and relax. Release could take the form of seeing a movie, going to bed early, enjoying a long bath or escaping in a TV show or book. November 29—First Quarter Moon: Manifesting. The angle between the Sun and Moon at the First Quarter phase represents an opening square aspect. A square presents a challenge to the status quo. Under the theory of lunar magic and mindfulness, this challenge is essential to the process of manifesting our intentions and becoming aware of our issues. Today the Moon in Pisces forms a square to the Sagittarius Sun. Pisces presents a new point of view that needs to be integrated for progress to occur. Pisces and Sagittarius have intriguing similarities and subtle but distinct differences, giving us a chance to broaden awareness and intention. Both signs are ruled by Jupiter and both signs have a tendency to move outward towards meaning and truth. The main difference is in style and impact—Pisces, following the path of water and Sagittarius, the path of fire. What does fire want to do? Shed light, transform, consume, give heat—these are a few of the instincts of fire. These instincts are part of this month’s potential, since this is the Sagittarius season. What does water want to do? Flow, dissolve, merge, sink down—these are a few of the instincts of water. How does the instinct of water challenge and help your intentions for this season? The graceful combining of water and fire is alchemical magic. What is the magic you are called to perform? As the Moon in Pisces forms a square to Venus in Sagittarius this evening (CST), the alchemical mixing takes place in social or interpersonal situations. How do we reach across differences?